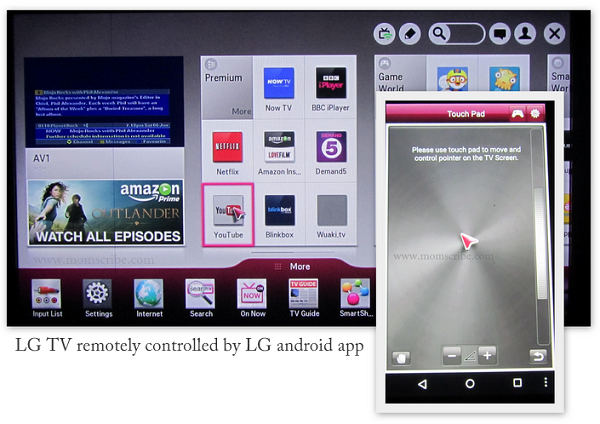 The idea of using the LG TV remote app from android dawned upon me when my remote control went dead. The sound on the TV was too high and I was unable to reduce the volume. And sadly, new batteries were nowhere to be found when it was needed the most. It was already night time and hence I sought the help of technology searching for "tv remote app" from the android apps store. Luckily, LG had its own set of apps and LG TV remote app was instantly downloaded for free on my Nexus 5 mobile phone. 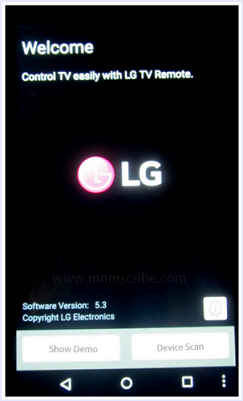 So this post is going to tell you all about installing and using the LG TV remote app for android. 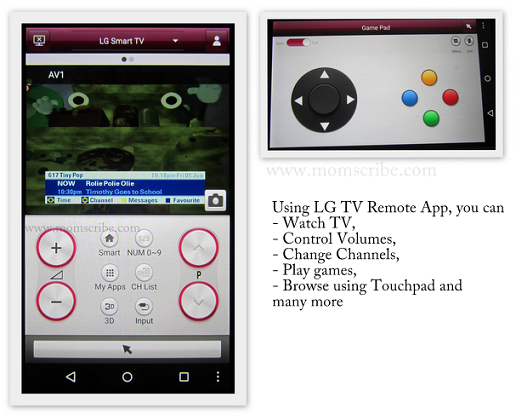 First, install the "LG TV Remote app" from the android store. After installing the LG TV Remote app on your mobile, you will get this Welcome screen on your mobile. Below,you can see two buttons namely "Show demo" and "Device scan". Before clicking "Device Scan", make sure that your TV is switched ON and then click it. When the app is able to detect your TV which in my case is a LG smart TV, you will be directed to "terms and condition" of using the LG TV app and upon agreeing to the T&C, you will be asked to enter the pairing key as seen in the below image. This key is what connects both the app and the TV for communicating with each other. 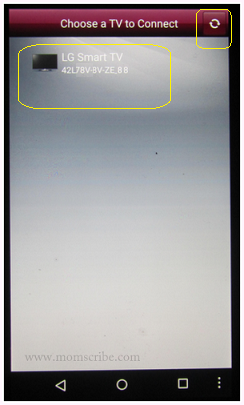 The key can be seen in the bottom of your TV screen as seen in the below image. 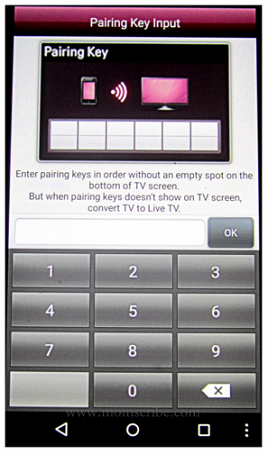 Now, copy the 6 digit key from the TV and enter it on the app. Then, click OK. If your pairing is successful, you will get a confirmation message on your mobile app as "LG Smart TV is connected. Do you want to set the current connected TV as a default TV?". Now, click OK.
By setting the TV as "default", we are making an automatic connection to the TV using our app. So, the next time when we use the app, it is not necessary to enter the pairing key again. All we do is to click the "Refresh/Scan" sign on the top for the app to load the default TV connection. And with one single click, we can control our TV using the TV remote control app. Now that we have successfully installed and connected our TV with that of our mobile app, we can use the features of the app to control our TV as we use with that of an ordinary remote control. No more worries of remote going missing or being in the hands of your spouse or kids [lol ;) ]. Apart from the "Touch Pad" , there are many more features like watching the TV on your mobile, controlling the TV by changing channels, adjusting volumes and even you can use your mobile as a control for playing games on the TV. Also, the "Touch Pad" speed can be controlled by changing its speed on the settings. And yes, finally the reason I installed this LG remote control app was successful as I was able to minimise the volume on the TV and even was able to explore more interesting features on the app like taking screenshots of the TV screen image ( using the camera icon) and editing it. The best part of this experience is that my kids couldn't believe what they saw when I used my mobile phone to control the TV. "Aww, mommy you are using your mobile phone to control the TV" . Err...yes, now I got to save my mobile. Thank you so much for this post. This came at the right time for us. We always use the remote control issued by the cable tv company. The only time we use our TV's original remote is to change the mode from AV1/AV2/AV3/HDMI. Since we came back from India (after 6 months), we could not find the remote. We could not order a duplicate remote from the manufacturer. The universal remotes will not work the mode function. Now, this morning, your post came as a big good news for us. I am going to download the remote app and see what happens. Thanks. Heyy thats a great idea.